Day by day commuters pass through Parramatta road, completely tuning out to the history that sleeps within the concrete standing either side of the road. For those who reside in Sydney’s west, this decaying old world is just another part of their journey. Walking down Parramatta road is like wandering through an industrial suburb in China Town. Each store is large in size, bright in color but completely vacant. Amongst these warehouses, there lay the other decomposing buildings that together form Sydney’s varicose vein, Parramatta Road. This entry was posted in Uncategorized and tagged Catherine Williams, Group: Romy, H10A, Katie and Catherine, MDIA2003, Thurs 10:30am Tute, z3291822. Bookmark the permalink. 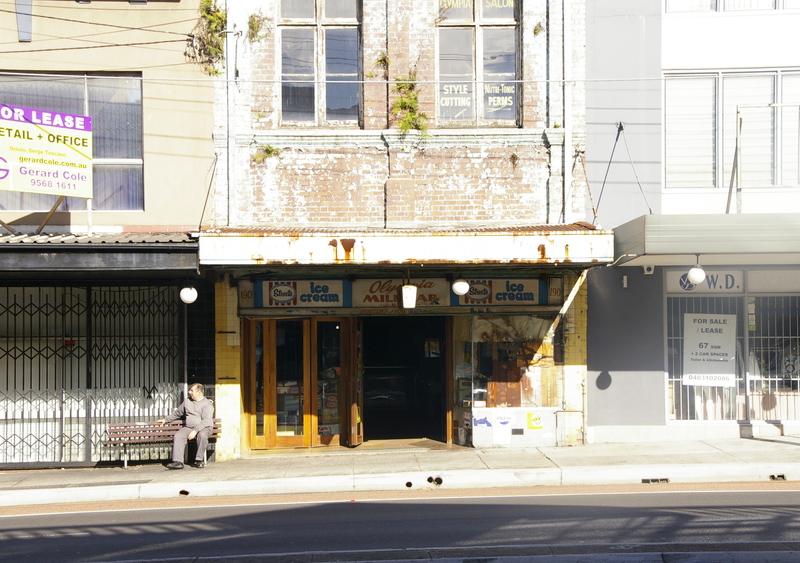 6 Responses to The Olympia Milk Bar: Dracula’s Den or Parramatta Road’s Treasure? A fascinating very well written account of what appears to sadly be another one of what are our vanishing urban treasures. Very interesting – a well written article. I pass by now and again and have wondered about its background. An interesting article concerning urban demographic change and degeneration. I remember well these types of buildings and buisinesses from the times when I lived in the Western suburbs. A good article Catherine! cool well written if i dare my self to walk in…. Somehow i feel that, culturally, we’ll be the poorer for it when he’s gone, remarkable how the myths build despite his reticence (or indeed as a result of…).